I am a Certified Hand & Foot Reflexologist through the Academy of Ancient Reflexology in St Augustine. Reflexology is a natural, drug-free healing therapy that puts the nervous system into a parasympathetic state, which is the only state in which the body can rest and repair. It is based on the idea that there are reflexes in the feet and hands that correspond to every system in the body, such as the musculoskeletal, respiratory, and endocrine systems. Reflexology is a protocol of manual techniques, such as thumb and finger-walking, hook and backup and rotating-on-a-point, applied to specific reflex areas predominantly on the feet and hands. These techniques stimulate the complex neural pathways linking body systems, supporting the body’s efforts to function optimally. Reflexology improves circulation of blood and lymph, relaxes by reducing tension and stress, promotes normal functioning of the body’s organs and glands, and helps support optimum health. My role is to support health, not treat disease. I do not treat, cure, or diagnose. In the state of Florida, reflexologists must also be licensed massage therapists. First, you’ll receive either a warm hand and/or foot soak and scrub, and we’ll discuss your health and goals for the session. 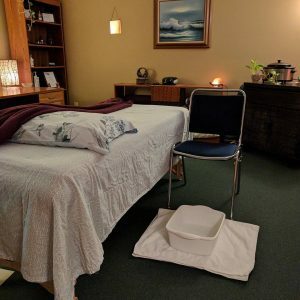 Then you’ll lie down on the massage table (but we have plenty of cushions if lying flat is uncomfortable) to receive the work on your hands and/or your feet. Feel free to zone out and fully relax, and if you notice any sensitive points, you can let me know, and I’ll stay at that point a little longer while you take some deep breaths, while we allow for change to occur. Want to know even more? 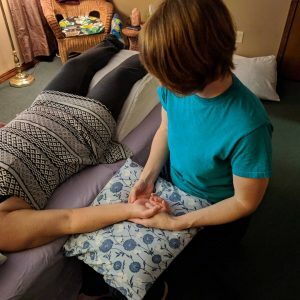 Check out this article I wrote ( Thoughts on Pressure in Reflexology) and a case study I prepared as part of my certification program (The Effects of Hand Reflexology on Chronic Hand Pain). Are you having issues related to high levels of stress? Do you have pain in your feet and/or hands? “Through reflexology, Annalisa provides a vital means through which I can be in a renewed state of lasting energy and at the same time achieve a state of rest that I cannot achieve on my own. I also find that sleep improves along with other bodily functions. I love reflexology!”–Elizabeth B. “As you probably know fibromyalgia deals with both physical and psychological pains and stresses. Reflexology gives me both the physical stress relief (i.e. pain relief, muscle & joint tension relaxation) and the psychological stress relief (i.e. feeling more relaxed, centered and balanced, less worried and less anxious), both of which trigger and/or exacerbate my fibro. Reflexology seems to calm the nerves so they don’t fire as much, as long or as intense. It can be a seemingly never ending cycle, which your reflexology interrupts.” –Chuck T.
To learn more, call me at 904-274-1584, or schedule at the link below.